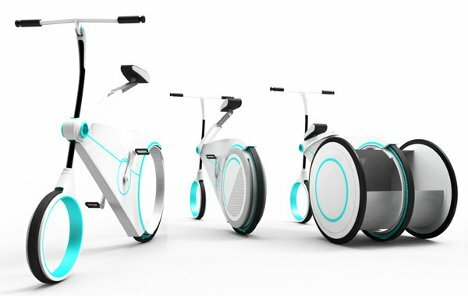 This bike concept from Yo-Hwan Kim takes into account the fact that different days often involve different errands for busy city dwellers. 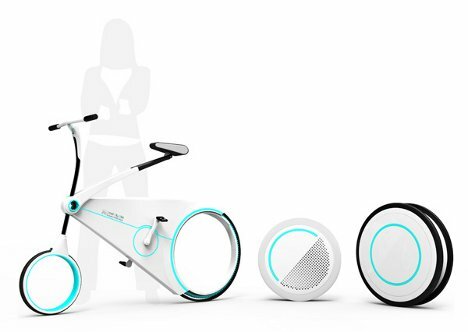 The Smart City Bike is expandable or retractable based on how much storage space you need right at that moment. It all has to do with the rear wheel, which can be switched at will between a standard wheel and one that is quite unusual, even in the world of concept bikes. On days when your travels will take you only to work and back, and you haven’t got more with you than what you can fit in your pockets, the standard back wheel will let you travel with plenty of agility. But for those days when you have to stop for supplies, you can equip the bike with the extendable back wheel. It begins as a standard-size wheel but can be extended until it reveals a pair of small carrying compartments. With the extended wheel base the added cargo probably wouldn’t cause instability but it would definitely be harder to maneuver than with a standard wheel. The design was an entry in the 2012 iF Design Talents competition.